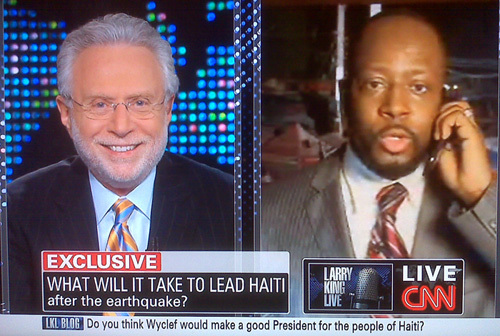 Barely 10 hours into his new career, Wyclef Jean went on CNN this evening and lied like a veteran politician. Appearing on “Larry King Live,” Jean was questioned by substitute host Wolf Blitzer about the finances of his charitable foundation as well as his personal income tax problems. On both counts, the musician, who today announced his candidacy for Haiti’s presidency, was not truthful in his responses to questions by Blitzer (who, sadly, seemed almost as informed as the regular occupant of the host’s chair). As first reported in these pages, Jean and a relative paid themselves more than $410,000 in foundation funds. This money purportedly went to them for rent, production services, and Jean's appearance at a benefit concert. And, of course, these are not “charges.” The group’s own tax returns--which were filed years late--disclosed this curious bit of self-dealing on the part of Jean, 37, and his cousin Jerry Duplessis, both of whom were foundation board members. Jean’s claim that “everything is paid up” will come as a surprise to representatives of the Bergen County clerk’s office, which a TSG reporter visited yesterday. Records in the Hackensack, New Jersey office clearly show that the three liens--covering Jean’s unpaid individual taxes for 2006, 2007, and 2008--had not been satisfied. The most recent lien, for $724,332, was filed by the IRS just 10 weeks ago. Actually, He Should Have Been Nicknamed "The Yankee Clapper"